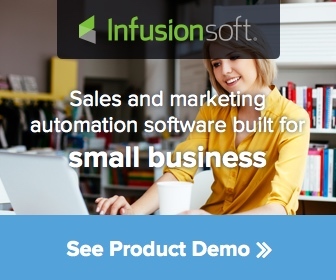 Infusionsoft is the gold standard of CRM systems. It is E-mail marketing and sales platform for small businesses, including products to streamline the customer lifecycle, customer relationship management, marketing automation, lead capture, and e-commerce. Not only does it have a fully integrated shopping cart, but it has autoresponders, affiliate / referral program, sends broadcasts, and opportunity stages. I am an Infusionsoft Certified Partner so I can get you the best deal – sign up here to view the demo. ONTRAPORT (formerly Office Autopilot) is right up there with Infusionsoft in CRM systems. It has all the functionality with exception of the “add to cart” feature that Infusionsoft has. Drip is relatively new and works a lot like the bigger name programs. It boasts an impressive visual workflow builder, automated actions, and tags so that you can segment your list. Prior to switching to Infusionsoft, I used Aweber for my autoresponders and to send my newsletter, e-courses, and other products. It’s versatile, secure, and integrates with other programs (from Paypal, eJunkie, to Membergate). A close competitor to Aweber is iContact. It has opt-in forms, autoresponders, and can send broadcasts. Pricing is similar and there are only a few features that iContact has that Aweber does not, such as image hosting and surveys. Overall, I have to favor Aweber, but it’s definitely worth looking at. ConstantContact is awesome! I used that program when I first started out and only had a newsletter. Just remember that this is mainly for sending out newsletters so if you want to provide programs, products, etc. then you’ll need the other programs as well. 1ShoppingCart and 1AutomationWiz are great if you need a middle of the road shopping cart solution or if you want to integrate autoresponders or digital delivery options within your shopping cart. WPeStore and WPAffiliate WordPress Plugins- A complete solution to sell digital products from your WordPress blog securely. If you don’t want to paying ongoing fees and commissions to sell via a third party web site, then WPeStore is a great solution. At only $49.95, you can sell your digital products, integrate with autoresponders, easy checkout and it’s a multi-site license so no need to buy multiple licenses for your other sites. While you’re on the site, check out WPAffiliate add-on for only $30 more. If you want something as a shopping cart as you are starting out, I recommend e-Junkie. It is a very inexpensive, and you can increase your plan as you grow. For example, for 10 products it is only $5 per month. It also has a built-in affiliate program (albeit very spartan!) and it integrates with Paypal so no need for an additional merchant account. Clickbank is an marketplace for digital information products. It aims to serve as a connection between digital content creators and affiliate marketers, who then promote them to consumers. It’s pretty easy to use and only requires a one-time payment of for the product activation fee after which you can add as many products as you want to your marketplace. This is great to use if you want to get up and going quickly as it automatically has the affiliate piece built-in. Instant Teleseminar by Xiosoft – If you are going to be holding teleseminars and want a professional delivery method, then InstantTeleseminar is for you. It’s easy to use, customizable, and provides Q&A submission page, replay page, slide presentation, and branding options. They provide a bridge line for up to 250 guests on the line and many more on the webcast, but you can also use a different bridge line if you prefer. Zoom is rapidly becoming a favorite tool in the online coaching world and those who do webinars. This video and web conferencing service allows cross-platform messaging, file sharing, and video, voice and screen sharing. One of its biggest draws is its high-quality HD video and features include recording, screen share, video conferencing, and audio calls. I also use it for my webinars, which you can upgrade your plan for just the month. OptimizePress lets you create any kind of pages for your business using WordPress. You can create landing pages, sales & marketing pages, training course pages, webinar registration pages, membership portals, product launch funnels, blogs, and mobile-ready versions of all pages. I use OptimizePress for all of my online training courses. You can use the theme or the plugin, which allows you to do one-pages much like LeadPages. I like it because it’s a one-time cost and I don’t have to pay monthly (unless you join their club and you get templates every month). Wishlist Member is a powerful, yet easy to use membership solution that can turn any WordPress site into a full-blown membership site. I use this in conjunction with OptimizePress to deliver training programs and control membership permissions. It’s a WordPress plugin so it’s super lightweight and easy to use. Lisa is a lifesaver! I needed help sorting out a complex Infusionsoft campaign and launch strategy. Lisa helped me sort it out in one Power Hour! Her Infusionsoft skills, teaching skills, professionalism, patience, and kindness combined are hard to come by in this industry. If you need help with an Infusionsoft campaign or strategy, I would highly recommend booking a Power Hour with Lisa. Lisa is a top-notch professional in every way. As a coach, I am often overwhelmed with all of the marketing tasks on my to-do list. After one hour on the phone with Lisa, I was able to get all of my questions answered and accomplish more than I had on my own in the previous 3 months! If you are struggling to figure things out on your own, stop wasting your precious time and call Lisa TODAY! Lisa is awesome! Infusionsoft is a huge challenge for me, so it was great to have such a pro take care of it. Whenever I asked for something that posed a challenge she got it worked out and made it happen. Don’t spend hours figuring out the nuances of Infusionsoft– have Lisa take it off your plate. Highly recommend her! I’m great with starting stuff, not so with finishing and Lisa is **the** finisher. Without her coordinating with other contractors to finalize and push out products like clockwork every single month, we would have some angry members and not much of a business. Not only that, she learns fast so there’s very little on boarding I have to do which is awesome. Thank you Lisa! Lisa is a whiz when it comes to working behind the scenes of a business! She is very detail-oriented, tech savvy, and always keeps the lines of communication open. I love how she always has my back, watching out for my business and stepping in when and where needed to resolve any issues (without me having to ask her). Lisa is a joy to work with and I, along with the rest of my team, really love and respect her as a valuable part of our business. I hired Lisa for “all things marketing & techy.” It was the best decision I could have made. My business has grown faster this year than ever before. With Lisa’s support, I’m able to create more products, launch more programs, and she keeps everything running like a well-oiled machine. I’ve been able to focus on things only I can do: coaching, creating and building my company. My business wouldn’t be where it is today without having Lisa’s support. She’s a super star! I’ve worked closely with Lisa since 2008, implementing numerous programs, product creation, etc. Honestly – anyone that can keep up with me, seem to read my mind and implement at the speed I do – is someone YOU should listen to! Lisa rocks and I cannot imagine my marketing plans without her. Lisa Wells should be the one wearing a cape! Not only has she has “saved” our site and healed our tech woes, she has been an absolute joy to work with. I cannot recommend Lisa strongly enough. If getting it done right, getting it done on time and on budget is important to you, then Lisa Wells will save you too! It was fabulous working with Lisa and I can see why she came HIGHLY recommended to me by someone who has the same high standards I do! She was friendly, patient, creative and 100% professional, helping me every step of the way and delivered me a final product that was just perfect and I would love to have her on board for future projects. Thank you, thank you, thank you Lisa! What I love about Lisa is her initiative. Lisa takes things right out of my hands and turns them around in the blink of an eye! She suggests different alternatives if she thinks they may be appropriate – in short, she takes all the thinking out of projects for me! Lisa not only frees up my time, she frees up my head space too, allowing me to concentrate on what I do best, leaving her to do what she does best. Now THAT is priceless!